I am continually drawn to The Third Man for a number of reasons, which I would love to highlight right now. To begin with, the opening credits come up and yet behind them is the rather odd image of a row of strings. As an audience, this is our first introduction to the zither, the twangy instrument that will create the strangely haunting score over the course of the film. Then, we are fed a casual bit of narration that quickly throws us into the story of western writer Holly Martins (Joseph Cotten), as he heads to Vienna to meet his old school chum Harry Lime (to be revealed later!). It seems safe to say that World War II was not good to the city, which is a mixture of ruins, cobblestone streets and ornate architecture that lend itself to an uneasy feeling. In other words, what happens in Vienna, stays in Vienna. Everything is zoned off nicely, and the authorities try and stay out of each other’s way. Martins learns soon enough that Lime is dead and yet it doesn’t add up. His best friend was hit by a car driven by a colleague, carried off the road by two friends, and diagnosed by his personal doctor who all happened to be present. Martins is urged by a Major Calloway to not get involved. Heading home would be a much better solution. But of course, Martins does not heed this advice. He meets Harry Lime’s girl, the beautiful but somber Anna (Valli), who has her own troubles with the authorities. Further investigation points to a mysterious third man who a local porter saw from his window. The old man winds up dead and soon Martins himself is threatened. Calloway encourages him to leave again before reluctantly disclosing that Lime was dealing diluted penicillin on the black market. That batch ultimately killed and harmed many a patient. It’s a whole different ballgame now. But wait, after dropping in on Anna, Martins sees a shadowy figure out her window and in a dramatic entrance Lime shows his face. A magnificent magic trick and fully alive. The next day on a Ferris wheel Lime’s true character comes out. All I will say is that he would have been at home in the Borgia family. Now Holly is conflicted about helping the police snag his old friend or heading home, wiping his hands of the whole ordeal. He finally reluctantly swings a deal because of his love for Anna. Plans are set and soon a trap is sprung for Lime. He is tipped off by a still faithful Anna, but the police force him to make his getaway into the sewers. That is where it all goes down for good. The next day Holly Martins waits at the side of the road for Anna. She slowly makes her way in his direction and without any acknowledgment, she keeps on walking on. She is now out of the picture and all he can do is light yet another cigarette. That is the cold and painful ending to The Third Man, a perfectly suited story for Post-War Vienna and a great Film-Noir. We become constantly aware of this film’s almost painful camera angles, at times, which slightly distort scenes and close in on faces. It is an unnerving feeling for the viewer which is only compounded by the bleak and shadowy cinematography, along with the haunting music. It all adds up to a perfectly chilling composition. The story feels starkly real too thanks to the on-location shooting and the mixing in of the German with the English. As a non-German speaker, this extra language only furthered my confusion and, at times, my paranoia. Along with Martins, I often could not understand what was going on, causing me to be more and more befuddled. All in all, although Orson Welles stole the show, both Joseph Cotten and Valli were superb. The two of them had the most screen time and it certainly was not wasted. Whether they were walking or talking they always made for an interesting contrast. Their accents, their demeanor, even their opinions of Lime were often in juxtaposition. I was not a fan of Trevor Howard, but he was not meant to be a likable character. Bernard Lee, on the other hand, had to be my favorite supporting role. 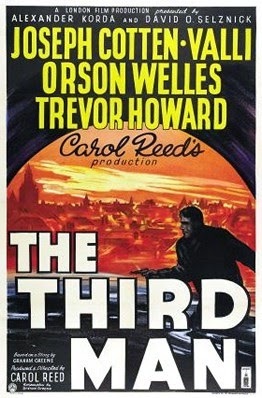 The Third Man is already on my watch list again and for good reason! Well done Carol Reed, Grahame Green, and Anton Karas! This entry was posted in 1940s, British, Drama, Film Noir, Mystery, Thriller and tagged Anton Karas, Carol Reed, Grahame Green, Great Film, Joseph Cotten, Orson Welles, Review, Trevor Howard, Valli by 4StarFilmFan. Bookmark the permalink.